Challenge #23: Take a picture of the most childlike spot in town. I purposely waited until I was “out” of town to do this one. Yes, Salt Lake City has its childlike spots, but I knew I was on my way to a town that houses one of THE most childlike spots in the world. Ov er Labor Day weekend my family and I vacationed to Anaheim, California. It was a trip that we had been planning for almost a year. 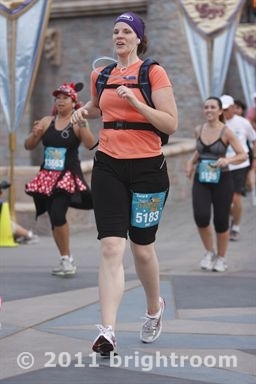 The reason for going was so that I could run the Happiest Race on Earth – Disneyland Half Marathon – which I did, and beat my time from my last half marathon. And, of course, while we were there we got ourselves 3 day park hopper passes to Disneyland and Disney’s California Adventure. And, let’s face it, Disneyland is definitely childlike! What better way to bring out the kid in you! All right, all right, so Disneyland is expensive. And many childlike wonders are absolutely free. (In fact, my original thought for this challenge was to take a picture of the Olympic fountain at Gateway.) But I know that for me as an adult, Disneyland brings back childhood memories that no other place can. Even if you’ve never been there before, being there reminds you of your favorite Disney movies, shows, characters, and songs, and before you know it you’re skipping down Main Street USA to the tune of “Flitterin'” or “Let’s Have a Drink On It.” (And if any of you can tell me which Disney movies those songs are from I will crown you the Awesomest of all Awesomeness!) Seriously, I would pay for a full price ticket just to sit on Main Street and listen to the ragtime music and people-watch. It’s THAT amazing! My mom ventured to try California Screamin’, a roller coaster that even I won’t go on! I ate a corn dog… and thought it was mighty tasty! 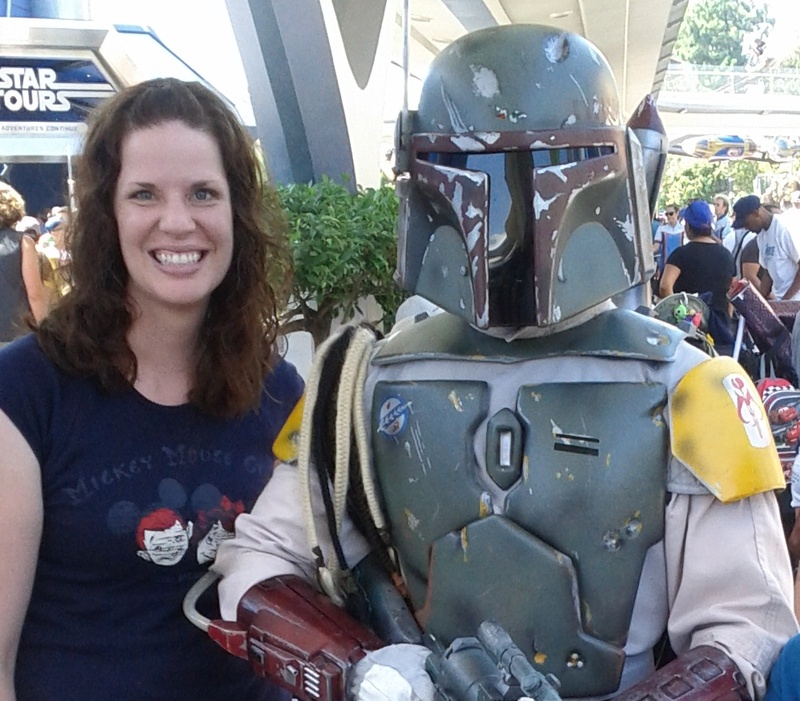 I got my picture taken with Boba Fett. How many people can say THAT?! Many of us found silly ways to pose for the pictures taken on rides such as Space Mountain and Splash Mountain. I went on Jumpin’ Jellyfish, and got made fun of by my 15 year old nephew. My mom tricked me into believing that her chocolate covered pomegranates were confiscated at the front gate. I was almost in tears over the whole thing! She’s so tricksy! My brother in law, who is also a marine, kept playing with the “explosive” TNT outside of Roger Rabbit’s Car Toon Spin. And many other misadventures! This was probably one of my most favorite family vacations to Disneyland (even though we missed one sister and her family who couldn’t make it). The music, the laughter, the happy screams, the junk food, the “kid” rides, the costumed characters, the bright colors, the families who wear matching outfits, ah yes, all these and more bring a smile to my face just thinking about it! My camera broke, so I really don’t have any more photos right now. And for some reason Facebook won’t let me download pictures, even if I’m tagged in them. So I will have my sisters email me more pictures so I can post them to show more good times! I hope you get a chance to visit the Happiest Place on Earth some time soon!